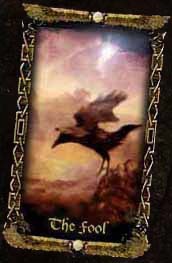 Raven's Tarot Site mediates a good overview about the Tarot, covering the basics regarding the four worlds of the Kabbalah (Kaballah, Qabala) and their corresponding levels of the soul, as there are Chiah and Atziluth as the highest level, followed by Neshamah and Briah, Ruach and Yetzirah and finally the material level Nefesh and Assiah. Of course, Yechidah as the universal plane is also mentioned. Narrowly related to the structure of worlds and souls is the Tree of Life as the universal symbol of the Kabbalah (Qabala) showing the Sephirot and paths of the tree. The site offers insight into each Sephira - Kether, Chokmah, Binah, Chesed, Geburah, Tiphareth, Netzach, Hod, Yesod and Malkuth - and a beautiful diagram of the Tree of Life itself. The Sephirot correspond to the Numbers (Numbered Cards) in Tarot which are also dealt with on the site, showing the fine and clear structure of the Minor Arcana. The Court Cards in the Minor Arcana are described in an overwiew, additionally there is an interactive page where you can find the place of a Court Card in the Zodiac as determined by Crowley, showing the places of the Court Cards within the decans of the Zodiac and under the influence of the astrologogical planets. The site also deals with the Elemental Dignities in Tarot in form of a walk-through, explaining to see the elemental dignities in pairs and in triads, as in other layouts. We also look at the Court Cards which embody elements within elements, have a short look at the Majors and of course explore the elements of Fire, Water, Air and Earth in particular. The history section deals with the History of the Tarot, from the Middle Ages and the Renaissance upwards, it looks at the society of those days, at the customs and beliefs to explain how the Tarot was born. A large section is dedicated to the Tarocchi di Mantegna, often called the Mantegna Tarot. The E-Series as it was copied and engraved by Johann Ladenspelder is fully introduced, each of the cards colorized by the Raven - that's me. The Mantegna cards provide a good look at the days of the Renaissance, and we find many hints to the traditional Tarot as we know it today. There is a short look on how to read Tarot cards, especially dealing with the negative aspect of the cards. It becomes clear that there is no real 'positive' and 'negative' in Tarot, it all depends on the viewpoint and everything has two sides at least. Being in esoteric and occultistic realms it is of utmost importance to not fall for any Creeds an Beliefs but stay sober and openminded. Logic, as un-occultistic as it might sound, is the only level on which you can thrive and develop - even in Magick! Therefore, socalled Tarot Spells have to be taken with a grain of salt, but the site shows that they can make wonderful mandalas. The is also a look at the Barnum Effect (Forer Effect) and an article about the technique of Cold Reading - both of which are not so uncommon as many Tarot readers might think. Raven's Tarot Site offers the chance to play with the cards on an interactive level. First, you can determine your essential card, find out your personality card and finally use my exclusive Taroscope to do an actual 'Tarot Horoscope' for you. You can then get the card's interpretations in the Card Window. You can also lay out the Raven's spreads on the site and see the cards in front of you. Raven's Tarot Site offers detailed explanations and interpretations about all 78 cards of the Tarot deck, covering the meaning of the 22 trumps of the Major Arcana as well as information about the cards of the Minor Arcana, their qabalistic interpretation and the coherences to the Tree of Life. While the Thoth Crowley Tarot cards are taken as examples, the information about the cards is general enough to cover all related decks with a Hermetic touch to them, for example the Rider Waite Deck, the Hermetic Tarot and many more. This part of the site contains a number of Tarot spreads or layouts that have proved valuable over the years. Each spread is demonstrated and can be laid out right on the computer, doing a kind of online reading for yourself. The cards can now all be laid out with the classic Gumppenberg Tarot of 1835, to provide an interestingly different view to the usual Thoth deck. Since my focus is on reflection and consideration quite a few of my spreads are reflection spreads. My alltime favorite still is the good old Newton Spread, designed after Isaac Newtons Laws of Motion. It reminds us that we are just another part of a most physical nature. Another one of these reflection spreads is the Raven's Eye, albeit with a little less physics in it. The little Blind Spot is a rather simple layout and the only 'stranger' on the site in so far that it isn't one of my own spreads. The Dark Star is a layout examining a process, a changable situation or a journey. It can be a reflection spread but it will always look at the movement, a development. In the same reign stands the Raven's Bridge, yet it is simpler and not so demanding as the Dark Star. Also in this line is the Raven Tree, which asks for success or failure of a growth, looking at the roots and the crown of the matter and since it is a tree, at the connection between them. Lastly there is the little Quick Croax, asking 'yes' or 'no' and 'why' without much fuzzing around. However, Tarot cards have a way to answer in their own right and you'll soon learn that the smallest spreads are not always the easiest. If you cannot wise up on a card at all you could use a Monocle to give it a harder and more thorough look. The Hermetic Principles are of some importance for the understanding of the Tarot, in so far as they embody universal wisdoms deeply rooted in esoteric thinking. If you like to do an online reading the site won't pop out some random cards for you, but rather let you shuffle the cards almost as in real. Using the prepared layouts in the Spreads-Section and the Card Explanation Window to get the meaning of the cards the querent can get an idea about the fascination of exploring the Tarot. However, never take anything without consideration - if you're fond of online readings, have a look on my thoughts about the matter. Finally, the site gives a peculiar look on the author, talks a bit about the main Tarot deck used and compares it so some other. There is also a good overview on highly recommendable Tarot books. I truly hope you'll enjoy your visit!